Manjit's Indian Restaurant uses their own specialised couriers to deliver their food. Light vegetable fritters filled with mixed vegetables, onions, potatoes, mustard seeds, turmeric, curry leaves served with mango chutney. 4 mini short crust pastry pockets filled with mixed vegetables and spices served with homemade chutney. Fritters of finely shredded onion, garam masala served with mango chutney. Indian cottage cheese marinated with kashmiri red chillies, finished in tandoor. Tender grain-fed chicken fillet marinated with yoghurt and spices, broiled in the tandoor oven and topped with fresh lemon and coriander finished with puree of cauliflower. Ocean perch fillets marinated with garlic, ginger, red chilli, tamarind and coriander; coated in chickpea batter and fried until crisp. A layered delicacy, with twice-cooked minced lamb seasoned with rustic cumin and coriander. Fresh soft-shell crab in a crispy ajwain and kashmiri chilli batter with tomato chutney and sour mango pickle. Shelled QLD tiger prawns sauteed with black pepper, garlic, rustic Indian brandy and sesame seeds. Shrimps battered with chick pea batter, served with dried chilli and curry leaves. Tender rack of baby lamb cutlets marinated in yoghurt, garlic, ginger, lemon juice and red spices broiled in the Tandoor. Full chicken marinated in spices, ginger, garlic extracts, lemon juice and yoghurt. Smoke roasted. Pink New Zealand ling fillets tandoor-cooked with 'ajwain', chilli and green coriander dressing. Line caught NZ ling fish with a sauce of fresh tomatoes, garlic, coriander and finished with garam masala. A kerala favourite of Australian white fish with ground coconut, onions, tomatoes, fresh curry leaves and mustard seeds. Tiger prawns cooked in a creamy coconut sauce infused with carom seeds and capsicum. Fresh QLD balmain bugs classic South Indian style, cooked in three extractions of coconut milk, gently stewed and lightly spiced with cloves and green chillies. Two simple words that described on of the richest and most iconic of Indian dish. Succulent chicken pieces wrapped in an utterly buttery combination of cream, tomatoes and aromatic spices, this composite dish is a culinary star that tickles palates across the world. At Manjits, we offer more than just Australia's favourite Indian dish. A traditional Indian-British favourite, fresh onions, capsicum and tomato combined with smokey tandoori chicken tikka pieces, topped with lemon juice garnished with garden-fresh coriander. Anarkali - the dancing girl that almost stole the Mogul throne, Tender morsels of lamb, sauteed with onions, tomatoes, pomegranate, and chopped mint leaves sprikled on the dish. A spicy curry dating back to the times of the British Raj originating from the Southern Indian city of Madras. An old classic and always a favourite! A king's favourite, known throughout India. A bowl full of highly flavoured and creamy textured, boneless curry. Gosht- An urdo word for meat. Blended to perfection with Mughlai style, fresh freen spices from the hill tops of Kashmir and puree of green leafy spinach. Rich gravy is used to finish the pot roast; caramelised onion rings, kashmiri paprika, tomatoes and garnished with green coriander and cordon of fresh cream. Manjit's famous preparation of tender, boneless beef gravy with fragrant spicy gravy of deggi mirch, cassia, star anise and barberries. A Portuguese-inspired dish. The meat is rested in malt vinegar and garlic. Cooked with pepper, cinnamon, limes and fresh red chillies. Traditionally served very hot. Lentils blended with clarified butter, green coriander, served with shredded ginger. Lentils cooked in a South Indian style with cauliflower, green beans, carrots, zucchini tempered with fresh onions, tomatoes, ginger, curry leaves and mustard seeds. Nine seasonal mixed vegetables with poppy seed (khas-khas), cashew, cassia bark, onion and tomatoes almond based curry sauce and a dash of whole cream. Peas and potatoes in a very smooth onion and tomato-based curry. Round chat potatoes cooked with ginger, mustard seed and fenugreek in a smooth tomato-based sauce. Spicy spinach puree and homemade spiced cheese. Smoked-roasted baby eggplant mashed with onion, tomato and chilli prepared on the traditional "tawa" hotplate. Home-made paneer and mixed vegetable dumplings, served in a rich tomato and cashew nut curry creamy sauce. 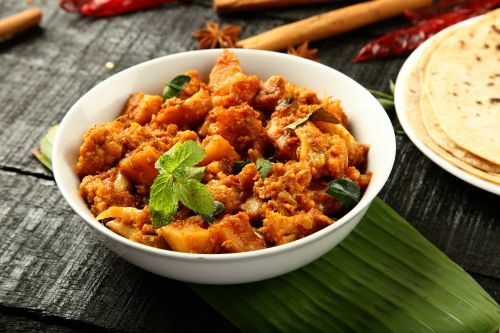 Dry combination of spices sauteed with fresh cashew nuts, served spicy with caramelized onions. Stuffed with Indian cottage cheese and spices. Stuffed with onion, mint and mice. Stuffed with clarified butter and lightly garnished. Flaky, crunchy on the outside and soft in the centre. Fluffy saffron rice with nuts and fruits. Selection of Garden mixed vegetables lighly spiced with mint, yogurt and coriander and cooked "dum-style" with basmati rice. Layers of tender slow-stewed lamb shoulder, lightly spiced with mint, yogurt and coriander and cooked "dum-style" with basmati rice. A specialty from the mogul days. Just the mention of rice pudding elicits more" ooh", "mmms", and "aaahs" thank any other dessert! A thick creamy pudding made with rice and milk enriched with shavings of fresh coconut. The ultimate comfort dessert. Spongy milk cake balls soaked in rose scented honey and sugar syrup. Delicious with a helping of clotted cream vanilla. A homemade favourite from the Manjits ancestral kitchen. Rich creamed cheese dumplings immersed in sweetened milk delicately flavoured with rose water and garnished with pistachio. Smoothness meets crunch in this velvety pistachio ice cream, punctuated by fragrant nuggets of pistachio nut below with the fresh taste on mango to finish.